We source our terpenes and extracts from one of the top extraction labratories in the country. 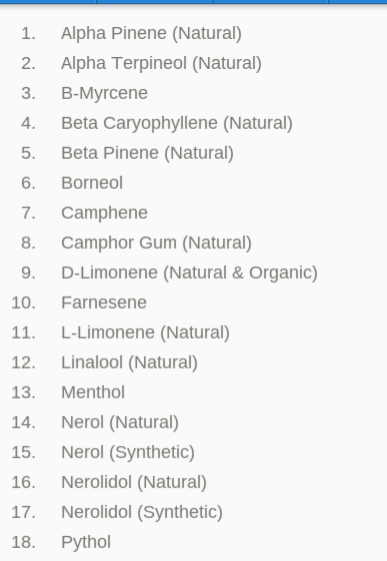 We have exclusive rights so no one else can buy terpenes through them except us. Every order comes delivered with certification paperwork so you know exactly what you are getting. With over 100 years of combined experience in this exact industry, the leaders in that company are expanding into the marijuana industry by offering the best service in high quality terpenes. We have the most difficult to find materials in the market. If we don't have what you are looking for in stock. We can most likely find it. Most of our clients are brand new to terpene infusion. They are discovering that the volitle process of blasting strips the concentrates of essential oils called terpenes. This is what causes bad tasting product. By putting our extracts into your product, you can create a better tasting and smelling concentrate. This allows you to take product like C02 or Ethanol and make them taste way better. Which in turn allows you to choose to charge more for your product. Most of our clients start out by purchasing one of our Terpene Sample Kits. This allows small scale testing to be done.